Ven. 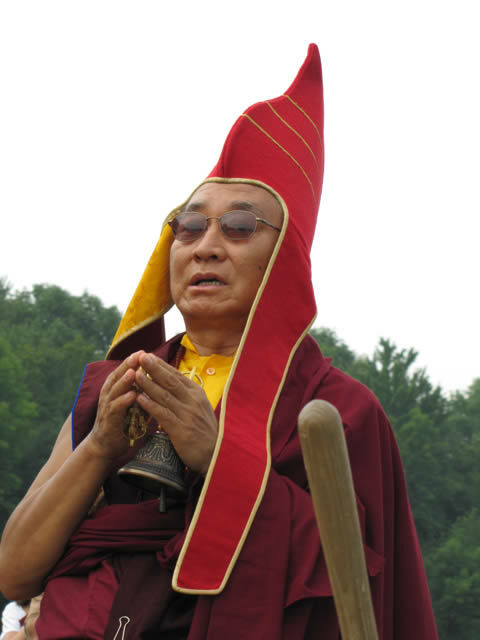 Khenpo Tsewang Dongyal Rinpoche has long expressed the wish that the Dharma be available in Middle Tennessee for centuries to come. The new Tibetan Buddhist Temple, designed according to Rinpoche’s vision, will be unique in the South. It will house Buddhist thankgas, blessed relics and will serve as a sacred place promoting peace and harmony according to the teachings of the Buddha. 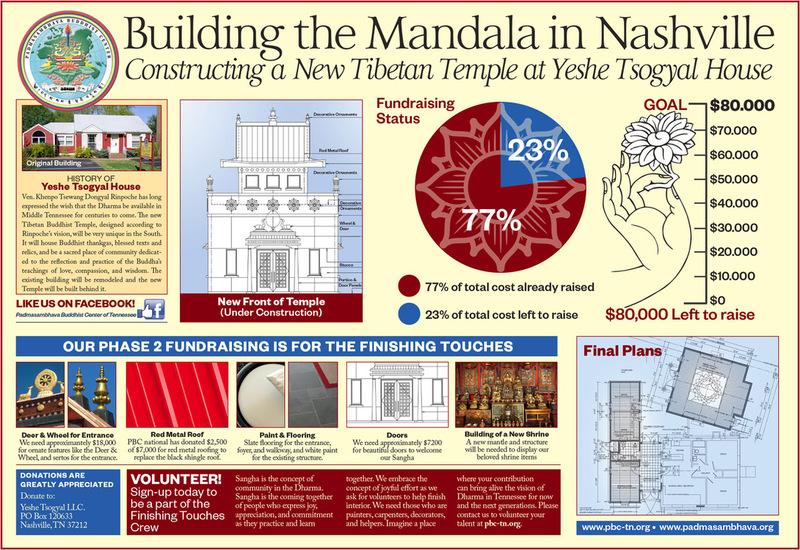 Please consider helping us complete the Temple at 419 East Iris Drive in Berry Hill. Your donations will help preserve our Teacher’s 2500 year+ lineage that dates back to the Buddha. We still need $65,000 to finish the inside of the Temple. The adjoining building will contain a bookstore/gift shop and handicap facilities. A red metal roof and white stucco finish will create a visually stunning jewel. Make a purchase from a wide range of jewelry, artifacts, art and services at the upcoming Silent Auction. All proceeds will be donated for the construction of the Buddhist Temple. The Silent Auction coincides with Ven. Rinpoche’s Public Talk Thursday, Oct 19th at Unity of Nashville (5125 Franklin Pike). Warm Greetings from Padma Samye Ling. Ven. Khenpo Tsewang Dongyal Rinpoche sends his sincere best wishes and prayers for everyone effected by the recent hurricanes, fires, and earthquakes. Rinpoche asks that you please continue to pray for everyone and all the many difficult situations unfolding in the world. As you all know, Hurricane Maria hit Puerto Rico quite hard. In fact it was the strongest and most destructive hurricane to strike the island since 1928. We have heard from a few Sangha members in Puerto Rico who let us know that they are safe even though the devastation is major. However, we have not heard from everyone. So, we are very concerned. Please keep them in your prayers. We’d like to help at least our Sangha members to recover as much as we can. Please consider donating toward a fund we have set up to assist in relief and recovery after this incredibly destructive storm. 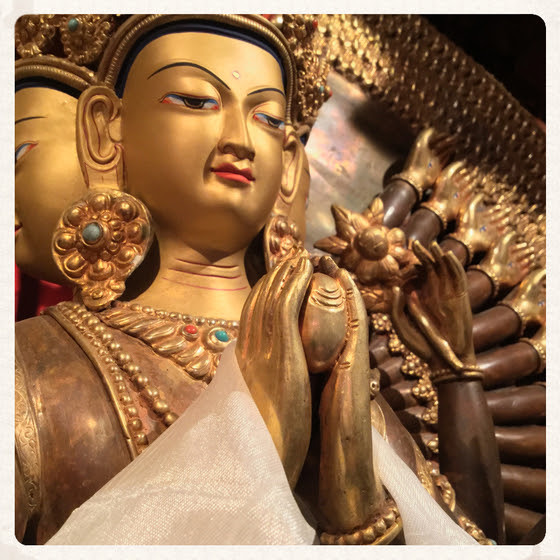 Your tax deductible donations can be made payable to “Padmasambhava Buddhist Center” with “Compassionate Action Fund” in the memo. We will share updates with everyone interested as they become available. Please feel free to forward this email to anyone you think may be interested. Enjoy Free Audio Teachings of the Venerable Khenpo Rinpoches! Authentic Heart Advice of the Venerable Khenpo Rinpoches! 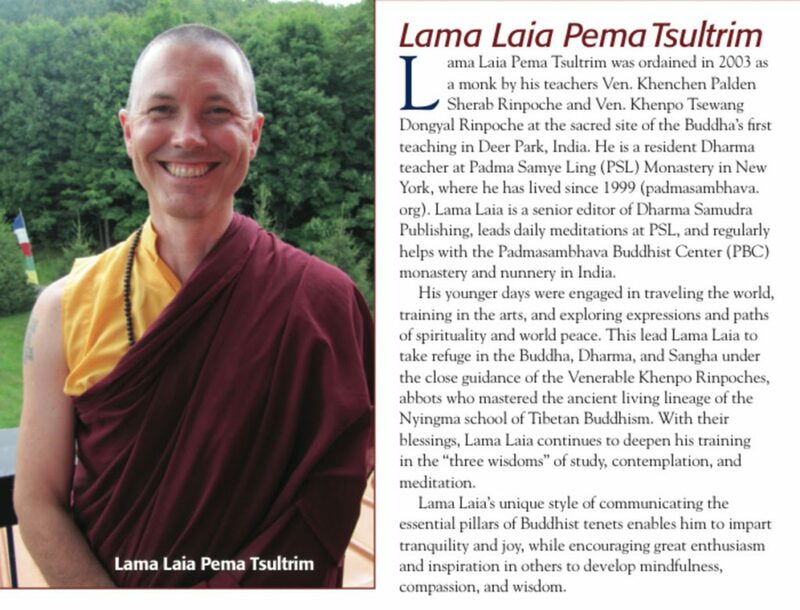 Join us tonight at Unity Church in Nashville where Lama Laia will be presenting Heart of Jewels: Buddhist Methods for Discovering Our Inner Treasures. The essential meaning of all the teachings of the Buddha is to liberate all beings from suffering and its causes, foster harmony and peace, and become thoroughly familiar with the nature and qualities of one’s own mind. The complete and direct realization of this path is buddhahood. 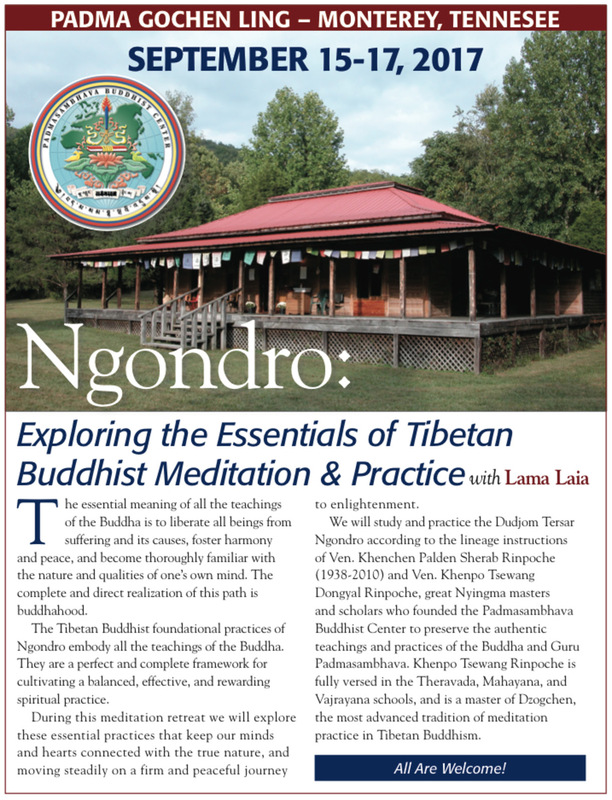 The Tibetan Buddhist foundational practices of Ngondro embody all the teachings of the Buddha. They are a perfect and complete framework for cultivating a balanced, effective, and rewarding spiritual practice. During this meditation retreat we will explore these essential practices that keep our minds and hearts connected with the true nature, and moving steadily on a firm and peaceful journey to enlightenment. We will study and practice the Dudjom Tersar Ngondro according to the lineage instructions of Ven. Khenchen Palden Sherab Rinpoche (1938-2010) and Ven. Khenpo Tsewang Dongyal Rinpoche, great Nyingma masters and scholars who founded the Padmasambhava Buddhist Center to preserve the authentic teachings and practices of the Buddha and Guru Padmasambhava. Khenpo Tsewang Rinpoche is fully versed in the Theravada, Mahayana, and Vajrayana schools, and is a master of Dzogchen, the most advanced tradition of meditation practice in Tibetan Buddhism. • Dudjom Tersar Ngondro. This will be the pri- mary practice for this retreat. • Buddha Sadhana – Used for morning practice. Some copies are available in the Temple. • Daily PBC Prayers Extended Edition – Opening and closing prayers for every practice. We are sad to have to inform you all that this year’s teachings with Venerable Tsewang Dongyal Rinpoche at Tashi Choling have had to be cancelled due to the ongoing smokey conditions and poor air quality in this area. This year, there are many wildfires surrounding Tashi Choling. None of them are anywhere near threatening the center at this point, but the smoke pollution has been very bad for the past 4 weeks–and the National Weather Service has issued air quality alerts daily and projects “patchy smoke” in the forecast for an indefinite period of time until the fires are all contained. Many of these days, the air quality has been considered “hazardous.” People have been wearing masks outside and spending as much time inside as possible, and children and the elderly are supposed to stay indoors. Everyone can physically feel the stress of this of these smokey conditions in the air. 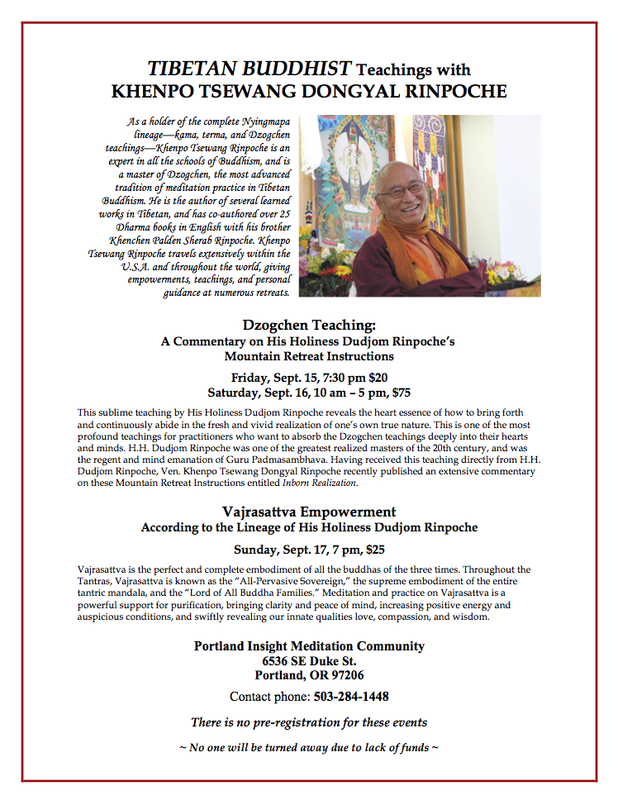 So, we after much soul-searching and fretting, we finally decided that it might be better if Venerable Tsewang Dongyal Rinpoche and Lama Lorraine were offered the option of going ahead with the planned visit or instead splitting their time between Portland and ODD. After much consideration of Khenpo’s health, they decided it would probably be best to put off their visit to Tashi Choling for a future date and split their time this year between Portland and ODD. In the meantime, please pray for all the many, many beings who have suffered in these horrible fires in the Pacific Northwest this year. Although Tashi Choling has not been directly threatened by these wildfires, we have nevertheless felt their presence. Moreover, many beings, including countless animals and insects, have lost their lives or suffered greatly as a result of these fires. Please pray for them: OM MANI PADME HUNG. 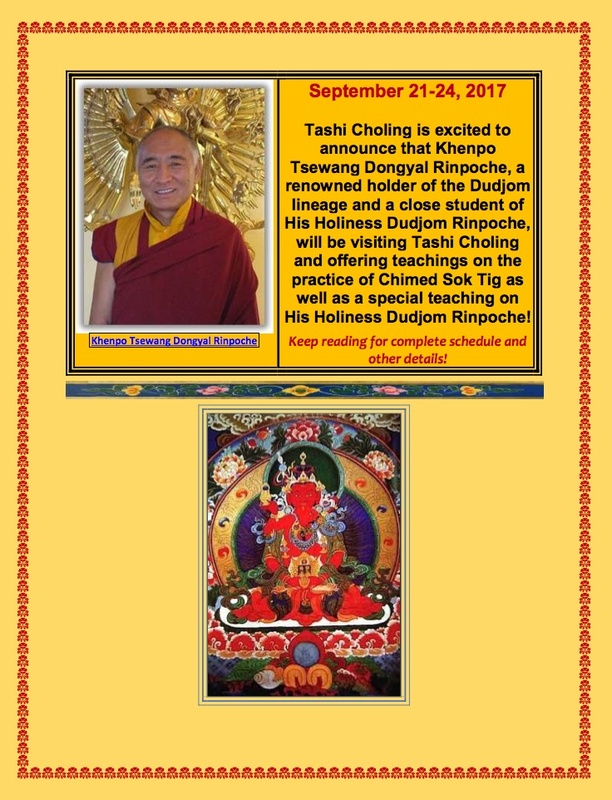 Tashi Choling is excited to announce that Khenpo Tsewang Dongyal Rinpoche, a renowned holder of the Dudjom lineage and a close student of His Holiness Dudjom Rinpoche, will be visiting Tashi Choling and offering teachings on the practice of Chimed Sok Tig as well as a special teaching on His Holiness Dudjom Rinpoche! Keep reading for complete schedule and other details! As a holder of the complete Nyingma lineage “Kama, Terma, and Dzogchen teachings” Ven. Khenpo Tsewang Dongyal Rinpoche is an expert in all the schools of Buddhism, and is a master of Dzogchen, the most advanced tradition of meditation practice in Tibetan Buddhism. 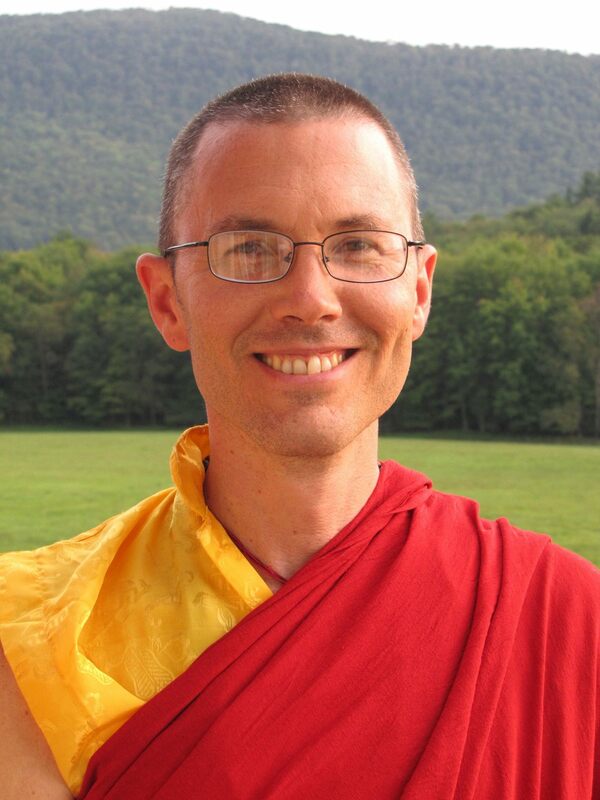 He is the author of several learned works in Tibetan, and has co-authored over 25 Dharma books in English with his brother Khenchen Palden Sherab Rinpoche. Khenpo Tsewang Rinpoche travels extensively within the U.S.A. and throughout the world, giving empowerments, teachings, and personal guidance. 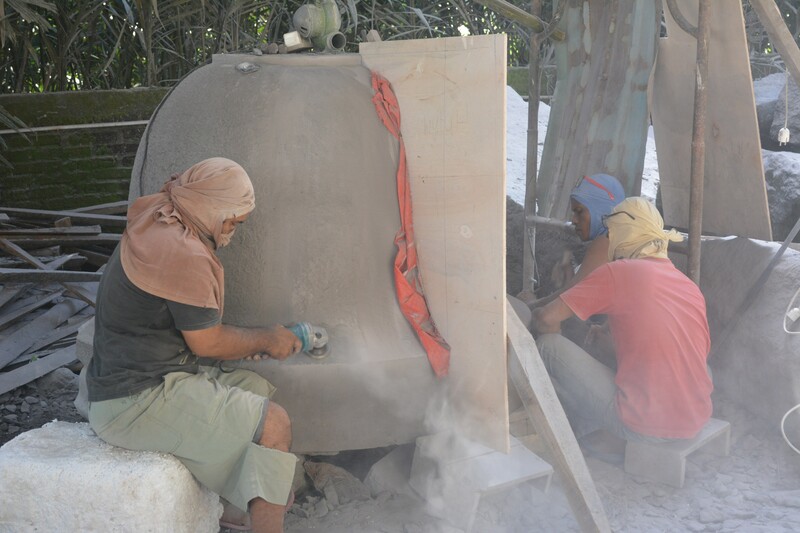 Carving on the Five New Stupas for the PSL meadow continues in Indonesia! If you would like to support this glorious, meritorious project in honor of our lineage masters, or a loved one, please go to the PBC website ( www.padmasambhava.org/psl-temple-stupa-garden/ ) or mail a check payable to “PBC” to Padma Samye Ling monastery, and note in the memo who the donation is being made on behalf of. Watch this video to learn how you can participate. On April 2, 2017 at Padma Samye Ling during the One Month Dzogchen Retreat, Ven. Khenpo Tsewang Dongyal Rinpoche announced that a long-standing dream of Ven. Khenchen Palden Sherab Rinpoche and his was coming true: Today begins the carving of five New Stupas that will be installed in the Padma Samye Ling monastery meadow!